A statement from a group of architects, urbanists, thinkers, and citizens in defense of the zad and this unique experience of living the future. This open letter was first published in Mediapart. January 17, 2018, the ultimate abandoning of a long hoped-for airport project in the Notre-Dame-des-Landes region of France is a promising victory for those supporting a new way of thinking in harmony with the environment. As one of the longest recent struggles in France concerning the environment and ecology, this substantial victory resonates as an expression of hope for those continuing to fight in the name of ecology. Nevertheless, the French government is still threatening to clear out and dismantle the zone. It’s for this reason that a number of architects, urbanists, thinkers, and citizens, have gathered together to write the following statement in order to defend this unique experience of living the future. The Victory Against the Construction of an Airport at Notre-Dame-des-Landes is based off a very large and diverse mobilization. Through the myriad of diverse means of struggle that have contributed to the abandonment of this airport project, the resistance by way of the permanent occupation of the Zone to Defend (ZAD) has a primordial place. For over tens years now, by continuing to allow for this territory to thrive, both the old and the new inhabitants living there have helped to preserve and prevent the destruction of both the natural lands as well as agricultural spaces. The population has gone to great lengths to care for these spaces through creating new forms of collective organization and the development of a variety of activities: woodworking, bakeries, the collective cultivation of vegetables and grains, professional forest clearing [bûcheronnage], the creation of a library, orchards, a brewery, cheese production facility, a cannery, an herbalist shop, musical gatherings, a tannery, a foundry, and a silk printing shop… They have shown that another way of living was possible, well beyond the state-form and standardized scenarios of industrial agriculture, as much through other modes of construction as well ways of imagining a viable and sustainable future for the rural and agricultural territories. Throughout this wooded countryside, one could see the invention and weaving together of a diversity of forms of life, all aspiring for a better harmony and balance with the territory they occupied. Within the interactions between the “historical” population, the farmers, the squatters, neighbors, both wild animals and livestock, vegetation, insects and trees, but also with everyone who passed through the region — friends, students, militants, travellers, artisans — everyone together created a common territory, beyond old notions of property, and other forms of belonging and typical routines of living. This full-scale experiment undertaken over a long period of time led each and every person to evolve in both their own representations as well as their personal practices, far beyond the landscape of the countryside. And for this very reason, the joyous horizon opened up by the ZAD in spaces other than in the metropoles, is something that should matter to each and every one of us. The ZAD is also the adventure of its construction. It can be seen in the construction of a renovated farm, through a collective construction site, through the new agricultural warehouses and barns created with fantastic architectural designs; it can also be found in the poetic force of a collection of cabins in the woods, it’s poetic force can found in the middle of a lake, at the edge of a wilderness or in a vacant field; The ZAD’s force can also be found in the presence of loosely constructed or nomadic habitats, the campers, trucks, and yurts that complete the inhabited landscape. Outside of the norm, multiple, diverse, poetic, adapted, makeshift, precarious, simple constructions — made out of local or reused materials — out of earth, wood, straw, or through the recuperation of previously used materials, these constructions respond, at their scale, to the ecological stakes and energy crises at hand, in direct contrast to the world that the industry of concrete and steel continues to construct throughout the entire planet. The constructions of the ZAD are also the result of an inventive architecture, one that is hands-on, DIY, and very creative, a construction process that is preferred through the collective stimulation of the ZAD collective, pushing folks — both those accustomed to such work as well as neophytes — to re-appropriate for themselves the activity of constructing something for themselves. The multiplicity of forms constructed shows the numerous possibilities for living and building outside of the logic of real estate and property essentially based on speculation leaving little way in latitude for the population or the architects to propose alternative solutions. Whoever traversed this territory, whomever participated at these construction sites, recognizes and knows the value of the forces that led to the other ways of renovating these farms and the construction of these cabins. In stark contrast to the autarkical image circulated against it, the ZAD is a space of passage, of exchange, a site itself that becomes a school; a school of life, but also a school for dwelling and building. What has unfolded there is the invention of a contemporary vernacular — composed of the current global concerns and made out of local materials. What has also taken shape there is the defense of a living heritage arising from out of a united struggle that has opened up our various imaginations. We are well aware that simply making our sources of energy cleaner, our buildings more ecologically sound, and creating more green cities, will not be enough to assure a sustainable future. We must also adhere to the importance of creating and discovering more simple and less excessive forms of life and uses of energy and resources — activities which we have fully committed ourselves to, has therefore led us to defending the ZAD, its current inhabitants, and their sites of living. Given the complexity of the situation and the debate regarding the legality of the situation, a resolution will doubtless be made in haste, through force and destruction. It is for this reason that only proposition that make sense is putting any decision regarding the future of the lands on hold and opening up of a dialogue according to the wishes of the members of the anti-airport movement. 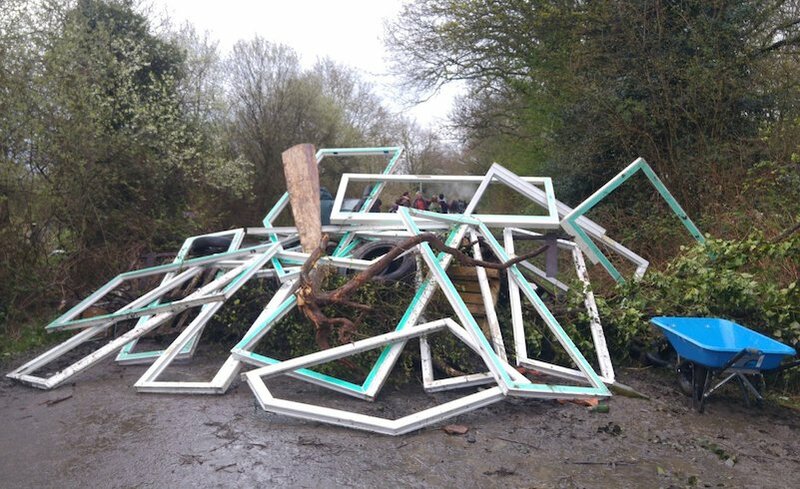 We are therefore opposed to any expulsion of the inhabitants of the ZAD as well as the destruction of its forms of collective organization and the atypical constructions that have been developed there and which will continue to be developed there. We are committed to defending those who are living there and affirm that new ways of constructing and building are today legitimate and necessary in taking into consideration the major ecological stakes our societies are confronted with.